Just arrived at O.R. Tambo Airport from a conference in the Midlands of KwaZulu-Natal, and thinking about sugar, not that it was a main subject of discussion at the conference, but I drove past great fields on my way from Durban earlier in the morning. The conference was organised by one of the major food producers, so the discussions were about the livestock and crop production outlook (grains, oilseeds and vegetables), and developments in the land reform debate. I have discussed these issues a bit in the past few days, I don’t want to delve into them tonight. It’s best that I discuss something a bit sweeter – sugar. 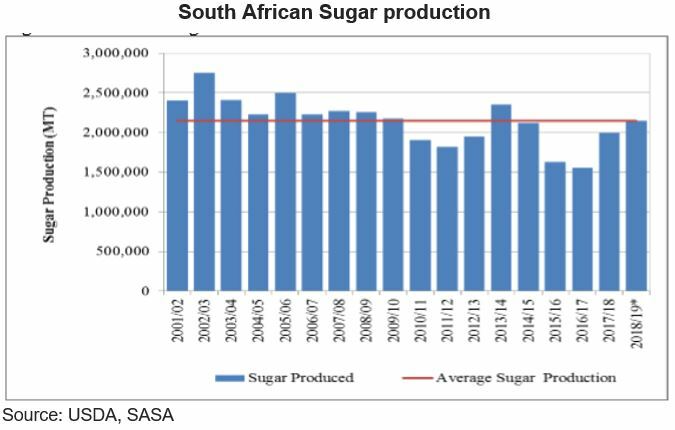 The great fields I saw along the way in the morning somewhat corroborated the optimistic sugar production outlook recently shared for South Africa in the 2018/19 season by the United States Department of Agriculture. I will rehash the key points a bit to provide context. The agency forecasts an 8 percent year-on-year uptick to 2.2 million tonnes this season. As I pointed out a few weeks back, this expected recovery is a return to normal sugar production levels after years of drought (see featured image). This improvement is mainly based on an increase in sugarcane delivered to the mills for crushing. The story is, of course, different when one looks at prices, specifically from a sugar cane farmer’s perspective which is currently seeing an 8 percent decline from the 2017/18 production season’s prices in 2018/19, according to data from the USDA. This decline is mainly on the back of increased supply and a potential reduction in sugarcane quality standards in some areas.